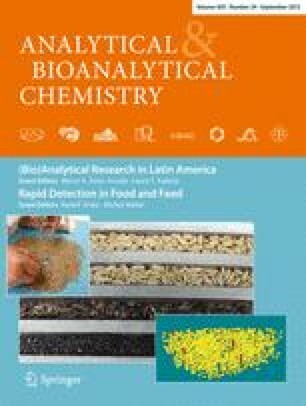 In this paper, we report the inter-laboratory validation (ILV) of a recently developed indirect competitive multiplex dipstick (Bee4sensor®) which is capable of the simultaneous detection of residues of some of the most frequently detected antibiotic residues in honey: sulfonamides, tylosin, fluoroquinolones and chloramphenicol. The multi-sensor dipstick can be interpreted via visual observation or by an instrumental measurement of four test lines. Statistical analysis of the ILV data demonstrated that the multi-sensor can reliably detect the presence of sulfathiazole at 25 μg kg−1 and tylosin at 10 μg kg−1, which fully meet the ‘recommended concentrations’ of the EU. Ciprofloxacin and chloramphenicol can be detected at 25 and 5 μg kg−1 in honey, respectively. Whilst the concentration for chloramphenicol is above the EU minimum required performance limit of 0.3 μg kg−1, this part of the multiplex test may still be of use to both the industry and enforcement authorities, to provide an early warning of contaminated honey. The estimated false-negative and false-positive rates for this easy-to-use and robust assay were less than 5 %. The Conffidence project is funded by the European Commission, call identifier FP7-KBBE-2007-1, grant agreement number 211326. The authors wish to thank the surveillance, LC-MS/MS teams and Michael Knaggs at Fera for analysing the test materials for residues of antibiotics and homogeneity. The authors thank the company Unisensor s.a. for supplying the test kits, instrumentation and their continuous support. The authors like to acknowledge the following laboratories for participating in this study: Fera (UK), CER (Belgium), Rikilt (The Netherlands), ILVO (The Netherlands), ANSES (France), Michaud (France) and one other.